Ohio keeps trying to cut early voting and the federal courts keep striking the cuts down. Last year, Ohio’s Republican-controlled legislature cut a week of early voting and eliminated the “Golden Week” when voters can register and vote on the same day during the early voting period. GOP Secretary of State Jon Husted also issued a directive prohibiting early voting on the two days before the election, and on weekends and nights in the preceding weeks—the times when it’s most convenient to vote. The lawsuit was brought by the ACLU and the Ohio NAACP. In 2012, 157,000 Ohioans cast ballots during early voting hours eliminated by the Ohio GOP. Overall, 600,000 Ohioans, 10 percent of the electorate, voted early in 2012. Blacks in Ohio were far more likely than whites to vote early in 2008 and 2012. “In the November 2008 election in [Cleveland’s] Cuyahoga County, African-Americans voted early in person at a rate over twenty times greater than white voters,” according to the Lawyers’ Committee for Civil Rights. In cities like Cincinnati, Columbus and Dayton blacks voted early in numbers far exceeding their percentage of the population. In 2004, Ohio had the longest lines in the country on Election Day, with some voters—particularly in large urban areas—waiting as long as seven hours to vote. A DNC survey estimated that 174,000 Ohioans—3 percent of the state’s electorate—left without voting. George W. Bush won the state by just 118,000 votes. 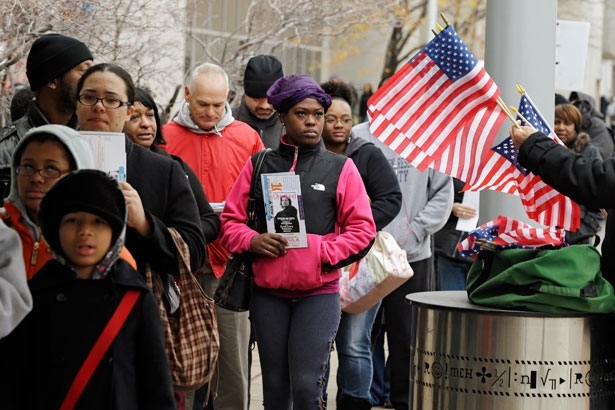 In response to the long lines, Ohio adopted thirty-five days of early voting in 2008, including on nights and weekends. But following the large Democratic turnout in 2008, Ohio Republicans drastically curtailed early voting in 2012 from thirty-five to eleven days, with no voting on the Sunday before the election, when African-American churches historically rally their congregants to go to the polls. Voting rights activists subsequently gathered enough signatures to block the new voting restrictions and force a referendum on Election Day. In reaction, Ohio Republicans repealed their own bill in the state legislature, but kept a ban on early voting three days before Election Day (when 98,000 Ohioans voted in 2008), adding an exception for active duty members of the military, who tend to lean Republican. These cuts disproportionately impacted black voters, who made up a majority of early voters in large urban areas like Cleveland’s Cuyahoga County and Dayton’s Montgomery County in 2008. Ohio Republicans brazenly tried to cut early voting hours in Democratic counties while expanding them in Republican ones. GOP leaders admitted the cuts in Democratic counties were motivated by racial politics. “I guess I really actually feel we shouldn’t contort the voting process to accommodate the urban—read African-American—voter-turnout machine,” said Doug Preisse, the GOP chair in Columbus’s Franklin County. These voter suppression efforts backfired in 2012. The Obama campaign successfully sued to reinstate early voting on the three days before Election Day (although Secretary of State Jon Husted limited the hours) and the overall share of the black electorate increased from 11 percent in 2008 to 15 percent in 2012. Despite the public and legal backlash, Ohio Republicans pressed ahead with early voting cuts in 2013. Now they’ve lost in court, again. (Some Ohio Republicans are also trying to pass a new voter ID law. Nine hundred thousand Ohioans, including one in four African-Americans, don’t have a government-issued ID). Judge Economus’s ruling could have broad significance. Ohio is once again a critical swing state in 2014, with competitive races for governor and secretary of state. More broadly, the courts are split over how to interpret the remaining provisions of the Voting Rights Act in the wake of the Supreme Court’s gutting a key part of the law last June. This is the first time a court has struck down limits on early voting under Section 2 of the VRA. A Bush-appointed judge recently denied a preliminary injunction to block North Carolina’s cuts to early voting and the elimination of same-day registration, a lawsuit similar to the one in Ohio. A Wisconsin judged blocked the state’s voter ID law under Section 2, while a similar trial is currently underway in Texas. As Rick Hasen points out, we still don’t know if the courts will consistently stop new vote denial efforts like voter ID and cuts to early voting. And the Roberts Court could very well overturn any good precedents in the lower courts. The Ohio ruling is an important voting rights victory. But it won’t be the last word.